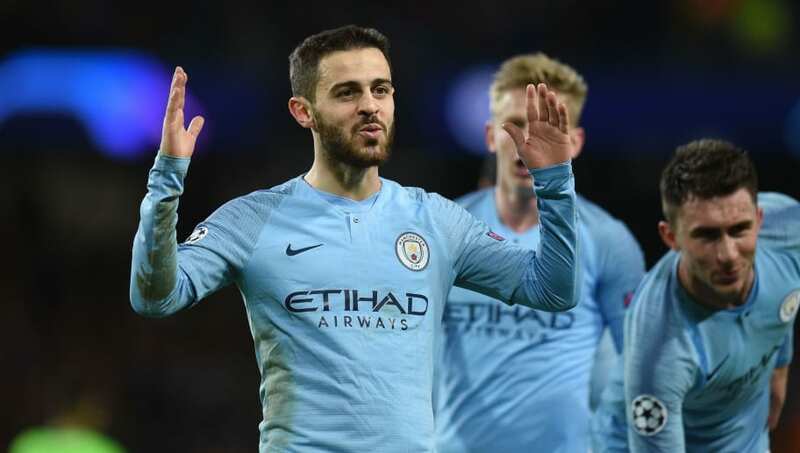 Manchester City ran riot against Schalke 04 at the Etihad Stadium on Tuesday night as a 7-0 win (10-2 aggregate) secured their progression to the Champions League quarter finals. City saw plenty of the ball in the opening exchanges but found chances few and far between against a resolute Schalke defence. ​The hosts should have taken the lead after 13 minutes, but Sergio Aguero could only hit the post from three yards out after Raheem Sterling had cut the ball back. Sergio Aguero has now scored 25+ goals in all competitions, a feat he has achieved 7 times in his last 8 seasons. However, the Argentine made no mistake from the spot 22 minutes later, dinking a Panenka penalty down the middle after ​Bernardo Silva was brought down in the box by Jeffrey Bruma. Aguero added his second from close range shortly after, despite a near three-minute VAR review, before ​Leroy Sane netted a third just before half time, calmly slotting past Ralf Fahrmann after Oleksandr Zinchenko played him in. The second half began as the first ended, with complete and utter ​City dominance. Sane had a goal chalked off by VAR before the German turned provider with a sublime pass to tee ​Sterling up for his third Champions League goal of the season 11 minutes after the restart. The former Schalke man grabbed another assist 19 minutes before the end, this time finding Bernardo Silva with an equally fine pass to make it five. The scoring didn't end there as Sane made it a hat trick of assists to set up Phil Foden for his first goal in Europe, before fellow substitute Gabriel Jesus fired under Fahrmann to record the joint highest knockout win in ​Champions League history. Guardiola's men were always firm favourites to progress into the quarter finals, even after surviving a scare in the first leg in Germany. It was a slow opening from the home side, lacking urgency in attack and finding it difficult to break down a determined Schalke side. However, although the match was played in Manchester, it was a case of London buses after that. It became a procession for City after ​Aguero netted the opener from the spot, with the Citizens repeatedly finding space down the channels from which they demonstrated their devastating attacking quality, and began scoring for fun from then on. The question has been posed on number of occasions both this season and last, whether Guardiola's side could do the impossible and complete an historic quadruple this term. You would be foolish to discount them, regardless of the sizable task at hand. The club have a favourable quarter final tie against Swansea to follow, a place in the last eight of the Champions League secured, and lead the Premier League by one point with eight matches remaining. Unquestionably demanding, yet remarkably achievable, if anyone can do it, it's them. There were a number of exceptional performances for the Citizens on the night, but none more so than that of Sane. The German scored a wonderful free kick to fire his side level in the first leg, yet shone on Tuesday night with further goal and a hat-trick of assists. He found space down the left time after time, and when he couldn't find it, he made it. Such was the performance of Sane it further emphasizes the quality oozing throughout the the City squad, as the 23-year-old isn't even a regular starter at the Etihad. You have to ask what else Sane has to do to earn a regular starting role, because on his night he is simply untouchable, as Schalke discovered in the most savage of ways on Tuesday. How #Sane doesn’t start every game for #City I have no idea. He is lethal! Unbelievable player. Die Königsblauen have enjoyed a great run in the Champions League this season, surpassing expectations to have reached the last 16 in the first place. Despite the odds against them, they performed valiantly in the first leg, taking a surprising, albeit temporary, lead having fallen behind in the match to eventually give themselves a sniff of hope heading into Tuesday's encounter. Barring Aguero's chance, City were kept at bay throughout the opening 33 minutes, with the German side well organised to snuff anything the hosts tried to create until the hosts were awarded their penalty. From then on, the floodgates opened and Guardiola's side showed their class. For a club now sucked deep into a relegation battle in the Bundesliga, their efforts over the first 120 minutes of this tie should give them encouragement in their fight for survival. Domenico Tedesco's men showed glimpses of their quality throughout, but ultimately came unstuck against one of the favourites for the Champions League trophy this season. No one player can take credit for Tuesday's performance. It was men versus infants on the night, as the visitors were simply outclassed all over the pitch. You can understand the players having their focus towards securing safety in the Bundesliga this season, ​however, the large and vocal traveling support will head back to Germany bitterly disappointed at their side's showing. They were the only winners on a miserable night for Tedesco's men. Manchester City are away from domestic action again as they travel to Swansea in the quarter finals of the FA Cup on Saturday before a 14-day break awaits them ahead of a trip to the capital to face Fulham in the Premier League. For Schalke they need to return to their battle for Bundesliga survival on Saturday as they face a tough test at home to RB Leipzig.